Mooragh Park hosted the Ladies Championship on Saturday 30th June with a field of 26 ladies. Three former champions, Jenny Moore (South Ramsey); Janet Monk (Mooragh Park) and last years winner Shelley Kennish (South Ramsey), along with Lyn Bolton (South Ramsey), Alison Keggen (Nobles), Amanda Lawler (Castletown), Caroline Whitehead (Port Erin) and Rebecca Teare (Nobles) made up the quarter finals. Two time champion Jenny Moore defeated fellow club mate Lyn Bolton to book her place in the semi finals and would face Rebecca Teare who booked her spot beating Caroline Whitehead. Amanda Lawler ended Shelley Kennish title defence and six time champion Janet Monk defeated Alison Keggen. In the first Semi Final Jenny Moore got off to a good start racing to a 13-4 lead after 11 ends. Rebecca dug in to chip away at the lead but couldn’t get a good run with the block and Jenny ran out 21-13 winner. The second Semi Final was a repeat of the 2014 final with Janet Monk taking on Amanda Lawler. Janet started the game very well having a run with the block which saw her build up a 11-2 lead after 10 ends. Amanda closed the gap to 9-15 before a run of three 2’s saw Janet close out the game 21-9. The final got underway with both players exchanging points in cagy a nip tuck battle which saw them level after eight ends with the score 5-5. Jenny and Janet tried to build momentum but with both bowling very well neither could make a break away. After 15 ends, with the game tight at 10-9 to Janet, the first decisive moment came. Janet reeled off a run of 6 ends to build a lead of 17-9. Jenny fought back with two quick doubles reduced the deficit to 17-13 before Janet moved within one point of victory 20-13. Jenny wasn’t done yet and came back finding a long mark which she settle on winning six ends to bring the scores level at 20-20. On the last end Jenny led a bowl which was just slightly tight and a yard through giving Janet room to leave her bowl counting for game. 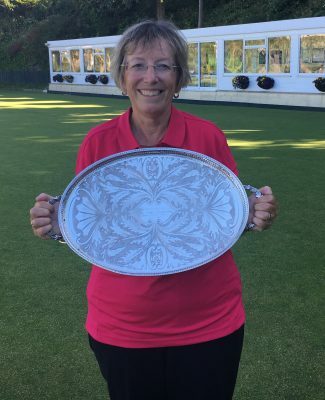 Jenny was unable to better her first bowl and Janet claimed her seventh Manx Championship extending her own record as the most decorated Ladies Manx Champion. At the conclusion of the competition the presentation was made by Heather Horsburgh and President Sue Peach who thanked Mooragh Park for hosting the competition and to all those who assisted with the running of the competition. The Dorothy Piearce Memorial pairs qualifier took place on Sunday at Finch Hill. Nine pairs entered the competition with the hope to represent the Isle of Man in August at Warrington. The eventual winners were Clare Cooper and Rebecca Leece (both Nobles) who beat Mary Alderson (Marown) and Lynda Cadamy (Port Erin) 21-17. Losing in the semi finals were Jenny Moore & Fiona Kennish and Elaine Moore & Gill Dixon. Following a busy week of bowls for the June Festival the night league returned. The superb weather the island has been treated to over the last couple of weeks has made most of the greens fast and very tricky. Kicking things off is the top 3 clash of Port St Mary vs Nobles. Second place South Ramsey sat out from this round of matches but were keeping a close eye on the match to see who would be top going into the final matches of the first half of the season. The Port St Mary green was running very fast with the home ladies using their home advantage to great effect to inflict Nobles biggest defeat since 2011. Ann Maddrell and Trish Bull got Port St Mary off to a flying start both winning 21-2. Katy Williams and Val Macfarlane followed this up winning 21-12 and 21-16 respectively. Alison Keggen got Nobles on the board with a 21-11 victory. In the second half Port St Mary dominated winning all four games with Jayne Kneen 21-4, Chris Price 21-11, Margaret Tasker 21-12 and Kellie Maddrell-Reeve 21-14. The final match score was 179-94 (8-1). Onchan welcomed Douglas with the match decided by 7 chalks. Onchan won five of the nine available games with Marilyn Ellison top scoring for the home side 21-6. The away side dug in and despite only winning four games Muriel Cain, Wendy Cowin and Paula Garrett all won to single figures to give the away side the chalks victory 136-143 (5-4). Marown faced Purt Le Moirrey and it was the away side who mastered the very fast green the best taking an overall win by 45 chalks. Chris Holland and Roma Ware won to single figures for the away team with wins also from Sandra Lowe, Win Collister, Brenda Hawkard and Rita Callister. For the home side Rosie Winckle, Elaine Dewhirst and Lil Smith. Final match score 128-173 (3-6). Peel entertained Ballaugh at Sunset City with the home-side just doing enough to take the victory. 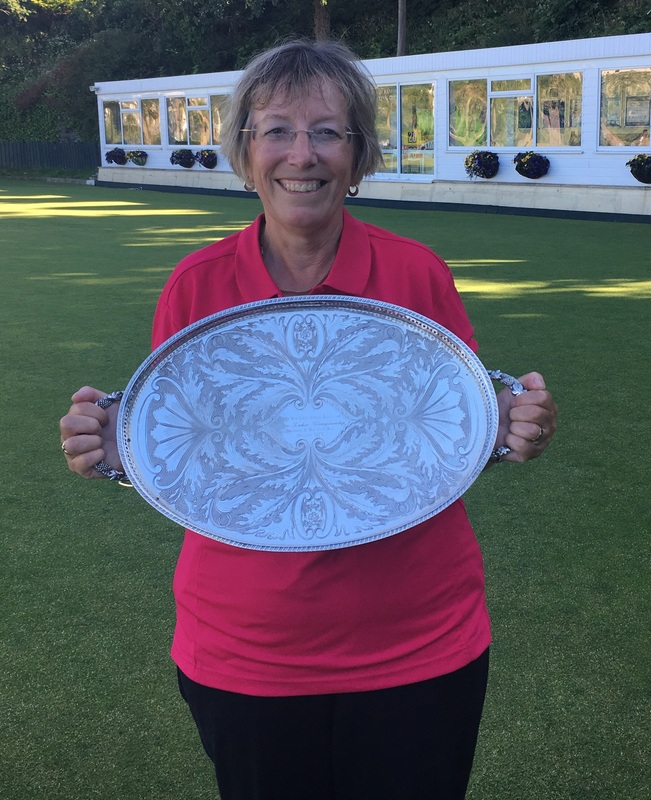 The match was tight on games with Peel winning five of the nine matches including single figure wins for Lynda Wilson and Sue Jones. Peel had the edge on the chalks to take the match 168-145 (5-4). In the final match Castletown A faced their B team for the first time this year with the league newcomers suffering a whitewash defeat 189-85 (9-0). With one game to go before the half way point Port St Mary hold a 20 chalk advantage over South Ramsey with Castletown only three points further back following their last four games in which they have averaged over 185. Nobles slip to fourth 104 points behind the leaders with clear daylight to fifth placed Peel Sunset. The title race will continue to be lively and I expect these top four teams to shuffle a little more before the end of the season. The Trend sponsored Ladies Over 60s League returned from the break for TT with the teams reaching the halfway point in the season. Peel Sunset have averaged 120 in their last three matches and improved this further by picking up their 5th maximum of the season defeating Douglas A away 48-126 (0-6). The result also means Peel Sunset take the top spot at the halfway stage nine points ahead of Port St Mary. Marown remain third following their victory away to Breagle 91-116 (3-3). There were wins for home players Steph Swift, Gwen Tuck and Kay Primrose-Smith. For the away side Margaret Scarffe, Ceila Joughin and Philippa Taylor all won. Nobles faced Ballaugh at home with the home side putting in a strong performance to win 112-74 (5-1). Flo Price and Joyce Ogden both won to single figures with Voirrey Oates picking up Ballaughs only win to prevent a whitewash. Onchan had a comfortable 15 chalk victory over Villa winning four of the six games. Home player Maureen Payne top scored winning 21-8 with Villa player Joan Murphy winning 21-9. Final score 108-93 (4-2). The league takes another week off due to the June Bowling Festival but returns the following week with a double week of fixtures. Champions South Ramsey extended their lead at the top to eight points with a 10-0 away win against Castletown A. Dido Kelly and David Bradford both won 21-3, whilst Chas Grills recovered from a poor start going 8-0 down before winning 21-18. Having competed in the Parish Walk on Saturday Stefan Kelly was quick out of the blocks going 9-0 up on Mike Hargraves before stumbling over the line 21-20. Whilst South Ramsey sit top at the half way stage they still have it all to do in the second half of the season with having to travel to the teams that sit in the top five, Marown A, Peel A, Onchan A and Douglas A.
Marown A sit in second place and will have been delighted to come away from their visit to the Villa with a 9-1 win over Douglas A, which stretched the gap on the teams below them. Captain Andy Kennish spared the whitewash for the home team with a 21-13 win over Phil Kelly. Dean Kipling and Paul Dunn made light work of their games beating Stuart Garrett and Ian Moore to single figures. Paul Kelly and Matthew Keggen were pushed a lot harder by Mervin Sayle and Keith Rise winning their games 21-18. Marown have seven home games in the second half of the season (due to their B Team being in the same division) and only have to face Onchan A away out of the top five, will fancy their chances of closing the gap on South Ramsey A to take their first league title since 2013. Third placed Peel A once again proved they are force to be reckoned with defeating visitors Onchan A 7-3, on another night it could have been 9-1 with Gary Smith and Tommy McMeiken both just losing out 19-21 to Jordan Cain and Phil Kerruish. Steve Crampton had a comfortable 21-13 win over David Proctor. For the home team winners Frank Watson was pushed hardest winning 21-18 over Mark Kelly. Captain Stevie Kelly had a good 21-10 win over June Festival quarter finalist Matthew Quirk, whilst Dave ‘Barney’ Kelly made it back from his World Cup visit to Russia to beat Kevin Quirk 21-14. Tom Kelly beat visiting captain Peter Slinger 21-13 and Jerome Surridge won 21-15 against Rob Monk in a result that put them eight points ahead of their opponents on the night. Port St Mary A sit in mid table and made the trek north to take on South Ramsey B, coming away with a 7-3 away win. Wayne Roberts won 21-3 over Christian Caley, whilst Ewan Cooil, Dan McCabe and Thomas Keggen had fairly comfortable wins, with Trevor Quayle pushed a lot harder before getting out 21-18 against Tony Dugdale. Home captain Ben Dugdale led by example winning 21-8, whilst Sid Bolton and Steven Waters both won 21-18 to help secure an extra two points for the team. North Ramsey A won 8-2 with Allan Callow and John Cannan both winning to single figures. Geoff Porter was pushed harder with a 21-18 win over Seamus Whelan. The winners for the visitors were Steve Durcan and Peter Addison. Marown B appear to have settled into division one nicely now and have given themselves plenty of breathing space to remain in the top tier following their 10-0 win over Douglas B, who appear set for the drop sitting nine points away from the two teams above them. I tipped Marown B to stay up at the start of the season and they look well placed to achieve this. No doubt helped by a quick green, the Marown players winning to single figures were Brian Kelly, Arnie Withers and John Kelly. James Kelly did well to beat visiting captain Andy Cannell 21-20, whilst another young star Bobby Thorne beat the experienced Pat O’Donohue 21-19. In division two, word is reaching me that Ballaugh have a running green, which hasn’t been the case for a number of years now, no doubt helped by the recent fine weather and taking advice from Mike Atherton. The A Team would appear to be enjoying this recording a 10-0 home win over Noble’s B. The visitors did have to give a game away due to being a player short. For the home team Steve Grant had a fine 21-4 win. Noble’s B continue their quest for promotion with a 7-3 home win over Finch Hill A, with their green not as quick as Festival week having been well watered ahead of their match. At the halfway stage Noble’s sit six points ahead of Castletown B, who had a slip up away to Peel C losing 4-6. The match ended 4-4 on games, however Peel picked up the aggregate thanks in part to Bob Berry’s 21-6 win. 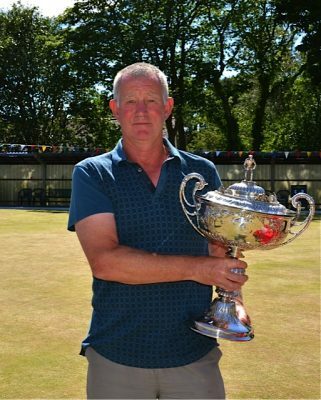 Onchan B drew 5-5 at home to Peel B, despite winning 5-3 on games they lost the aggregate by three chalks with David Smith defeating Bernie McPhee 21–9. Onchan returned the favour with Paul Bailey beating Peter Greenlees 21-8, however of their other four winners Mike Alexander, Mike Thomas and Edward Carlyle could only win 21-19, whilst Roger Payne just got over the line 21-20 against Paul Quirk. Port St Mary B took on their C Team with three big wins for the B Team, Dave Saxon, Paul Russell and Ray Maddrell all winning to single figures. Winners for the C Team were Ken Karran who beat Peter Collins 21-17, whilst Milton Cubbon stepped in to roll back the years beating Tom Collins 21-13. Port Erin B didn’t fare well on their visit north to take on North Ramsey B at Mooragh Park, with the home team winning 9-1. Sparing the visitors blushes was Christopher Dent who beat Barry Teare 21-15. Winning big for North Ramsey were Alex Yates, Bryan Corner and Brian Colquitt. In division three match of the week was Ballaugh B who took on league leaders Marown C. The home team had an 8-2 win, which allowed them to leapfrog the visitors to sit top of the table at the halfway stage. The two winners for Marown were Dan Smith and Stephen Rundle, whilst Dicky Watson won to single figures for Ballaugh. The other five winners for Ballaugh rather unusually recorded wins to scores of 15,16 17,18 and 19. Castletown C slipped up away to South Ramsey C with the home team winning 7-3. This only tells half the story as Castletown gave away three games due to only being able to field five players, which pains me as the club up until a few years ago regularly had four teams competing in the league. James Drinkwater, Juan Drinkwater and Philip Smith all won for Castletown, whilst the two winners for South Ramsey were Anthony Kelly and Paul Routledge. Finch Hill B closed the gap on the teams above them with a 9-1 win over Douglas D. Greg Brew was the only winner for the visitors beating Guy Smith 21-17. Finch Hill were awarded two walkovers. Home captain Pat Maher and Sam Stannard both won 21-9, with new bowler Brian Murphy winning his second game of the season, along with another newcomer Paddy Murphy who I am tipping to come on leaps and bounds, as he picked up his first league win in only his second league game for the club. It is great to see a player who has recently taken up the game getting around the opens, as this will definitely help improve his game. Onchan C recorded a 6-4 home win over South Ramsey D, helped in part by Paul Clinton receiving a walkover. Winners for Onchan were Brian Woodall, Mike Kelly and Derek Anscomb. For South Ramsey Matthew Corkill and Ian Moore both won to single figures, with James Moore and Franz Ten Donkelaar also winning. Peel D had an outstanding 7-3 away win against Douglas C, with Steve Tate and Bert Quayle winning to single figures, John Lightfoot who won 21-19 and Leslie Halsall winning 21-20. Winners for the home team were Parish Walk finisher Juan Readshaw, along with Keith Fearnley and Mike Cain. The top prizes in the Isle of Man June Bowls Festival went to two Cumbria players. In the Men’s competition it was Martin Gilpin (Kendal Vic) from Cumbria who picked up his first June Festival win and the winners cheque for £3,000. Gilpin had to overcome the challenge of Chris Kelly (Thongsbridge) in a thrilling final on a tricky green. Kelly was quickest out of the blocks taking a 13-6 lead, then 16-9 and 17-13. From there Gilpin chipped away at the lead to draw level with his opponent. At 19-19 Gilpin sent the jack out which was less than a yard from the edge, however he was unable to keep his first bowl on the green. Kelly played a yard short bowl which Gilpin was unable to beat with his second, and Kelly missed the opportunity to make two for game. At 20-19 up Kelly led a bowl two foot to the side of the jack with Gilpin putting one a similar distance the other side of the jack. Kelly made sure he was counting by glancing the jack towards his side bowl to lie two and within touching distance of his first Festival win. Gilpin had other ideas, ensuring he reached to sit on Kelly’s back bowl to count one to leave the score tied at 20-20. Gilpin headed for a longer length mark and left his bowl just under a yard away, which Kelly was unable to beat which gave Gilpin the title. Kelly had the blow softened receiving a cheque for £1,000. Gilpin reached the final courtesy of a 21-10 win over Colin Price (Dukinfield Central), whilst Kelly booked his place in the final defeating Thongsbridge team mate Craig Gant 21-9. All the quarter finals in the Men’s tournament were the closest games I can recall with Onchan’s Matthew Quirk losing 19-21 to Price. Quirk received the George Craine trophy for the furthest Manxman. Phil Lee (Wallasey) just lost out 20-21 to Gilpin, whilst Gant ended the challenge of Nigel Briggs (Brighouse) 21-19. Finishing off the close games Kelly played another Thongsbridge team mate Jack Dyson with this also going to the wire with Kelly winning 21-19. In the Ladies main competition it was another player from Cumbria Angela Athersmith (Ulverston Cons) who won the Ladies title and a cheque for £1,000 with a hard fought 21-19 win over Caroline Hall (Cleveleys WM) with the final being nip and tuck all the way through with neither player able to take control of the game. Hall received a cheque for £600 as runner up. The semi-finals were close with Hall defeating Rachel Quirk (Crossgates) 21-17 to reach the final, whilst Athersmith was pushed harder by Diane Harrison (Lune Road) 21-19. Furthest local player reaching the quarter finals was South Ramsey’s Elaine Moore who received the Visit IOM.com trophy. Moore’s challenge was ended by Hall 13-21. Joyce Foxcroft (Lune Road) lost 10-21 to Quirk, whilst one of the favourites Sarah Fox (Woodlands) lost 20-21 to Harrison. Karen Hill (Ossett Flying Horse) lost 10-21 to Athersmith. The Men’s Tourism was played down to the winner on Thursday morning on Noble’s 1 with James Wilcox (Crossgates) following up on his June Festival win in 2017 with the Tourism title defeating Callum Wraight (Castlefields) 21-18 in an entertaining final. Losing semi-finalists were Phil Lee 18-21 (Wallasey) to Wilcox, whilst Paul Bailey (Meersbrook) lost out 12-21 to Wraight. The Ladies Tourism was also played down to the winner on Thursday morning on Noble’s 2 green with another entertaining final it was Sarah Fox (Woodlands) who held her nerve to bowl a winner at 20-20 which after being measured in this was enough to earn the Tourism title with a 21-20 win over Jackie Butterworth (Knutsford BC). Fox earned her place in the final following a hard fought 21-20 semi-final win over Debbie Leece (Noble’s) after coming back from 16-20 down. In the other semi-final Butterworth had a comfortable 21-10 win over Mary Alderson (Marown) to book her place in the final. The Men’s consolation was won by Melvyn Byron (Marton Institute) who beat Kevin Nicholas (Gresford Colliery) 21-17 in a close final. The Ladies consolation was won by a regular visitor to the Island with Joyce Jones (Syke BC) defeating Amanda Nicholson (Gresford Colliery) 21-16. The Visit.Com Flyer title went to Callum Wraight (Castlefields) who had a 9-3 win over Martyn Watkin (Cortonwood), whilst the Last Chance Mixed Final was won by Matt Gilmore (Wallasey) who beat Craig Ramell (Rishton) 21-15. In the doubles competitions the Open Doubles was won by Joshua Mordue (Pudsey) and Joseph Cranston (Crossgates) with a 11-8 win over Conor Chamberlain (Stretton Anglesey) and Stevie Kelly (Peel Sunset) in a close final. The Men’s doubles was won by Joseph Cranston (Crossgates) and David Gwilliam (Nursery Inn) who beat Alex Power (Bar Lane) and Dean Butler (Rishton) 11-6 in the final. The Mixed pairs had local representation with Edward Carlyle (Onchan) and Sharon Ridgen (Penwortham Sports) just losing out 7-9 to Lee Longland (Rishton) and Sarah Edmondson (Rishton). An entry of 40 contested the Ken Williamson Trophy at Onchan on Saturday. A hot summer’s day provided a fast green which would ultimately prove beneficial to the home players. Eight preliminary round games were played with the highlight being young Ryan Hargraves’ first Open game win coming back from 20-13 down to win 21-20. First round games saw players begin cautiously as finding a length proved difficult. Eight Onchan players eventually progressed through to the second round. The most impressive result of the second round was Trevor Quayle’s (Port St Mary) defeat of home captain Peter Slinger. 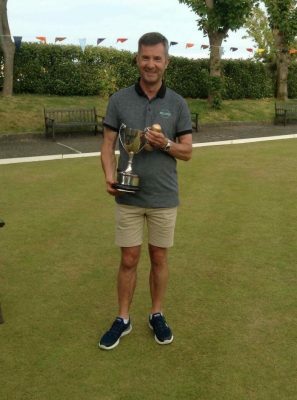 Local knowledge proved decisive in the quarter finals with four Onchan players progressing through to the semi-finals with Quayle losing out, along with the Marown trio of Ian Kissack, Brian Kelly and Paul Dunn. In the first semi-final Kevin Quirk defeated Mike Thomas 21-13 in the battle of the ‘old masters’ whereas Matthew Quirk came out on top against Rob Monk in the ‘young guns’ contest. A tense final saw Kevin take an early lead only to be overtaken by Matthew on the 18th end. Kevin regained the block soon after, however, to run out a winner by 21-18. A note of thanks to Ken Williamson’s family for their continued support & provision of replicas, also to the Onchan Ladies for providing the refreshments throughout the day. The PokerStars IOM Invitation took place on Friday evening at South Ramsey Bowling Club immediately after the conclusion of the IOM bowls festival. It was a strong field taking part with every player in the field having played county bowls. The format was 31 up with 5 on the card which is a format that hasn’t been played for a number of years on the Island, but is a popular format across the water. Robby Fitzpatrick (Merseyside) was the first jack on taking on Billy Speed (Lancashire), with Speed taking control of the game early on without ever going behind in the game. Speed won to a comfortable 31-20 score. Local player Jordan Cain made his first appearance in the competition, with Cain only one point behind Carl Fielding (Warwick and Worcester) at 20-21. Fielding took control from there to see the game out with a 31-22 victory. 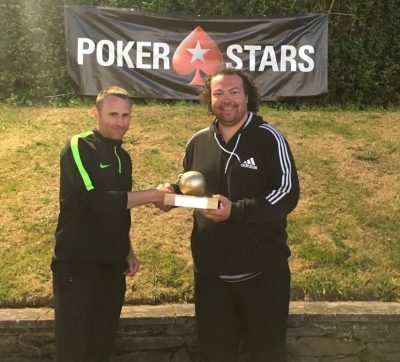 Derbyshire man Conor Chamberlain took on five time Manx Champion Colin Kelly, with Kelly’s knowledge of the green over the years proving enough to take a 31-21 win. The final game in the top half of the draw had top Merseyside player Matt Gilmore taking on North Lancs & Fylde man Dave Jackson with Gilmore taking the biggest win of the round with a 31-19 victory. In the bottom half of the draw Jon Palmer (Shropshire) took on James Wilcox (Yorkshire) with Wilcox proving too strong for Palmer taking a 31-23 win. Nidge Hughes (Merseyside) took on one of the top players on the bowls circuit Callum Wraight (Shropshire) with Hughes hanging on to the tail of Wraight throughout the game and lying two bowls on top of the jack at 27-29, however Wraight had one of his trademark strikes taking off both of Hughes’ bowls with the jack staying on the green to leave himself one. Wraight secured another single on the next end to win 31-27 with Wraight’s striking ability being the difference. Richie Goddard (Shropshire) and Kevan Shaw (Lancashire) was a good encounter with several tight ends and measures with Shaw getting over the line 31-26. The last game in the bottom half of the draw had Paul Bailey (South Yorkshire) taking on Merseyside man Phil Lee with the game being close throughout with Lee going 30-27 up before Bailey hit back with two singles and a two to edge it 31-30 to book his place in the quarter finals. The first game of the quarter finals had Speed up against Fielding with Speed taking an assured 31-23 win to book his spot in the semi finals. Colin Kelly had his challenge ended by Gilmore who had a comfortable 31-17 win. In the third quarter final Wilcox took on Wraight with the game living up to expectations. It was close throughout with the score tied at 27 and then 29 with Wraight scoring a double to secure a hard fought 31-29 victory. In the last quarter final game Bailey was always ahead against Shaw taking a 31-19 win. In the first semi final Speed took on 2015 winner Gilmore with Speed using all his experience to book his spot in the final with a 31-28 win with Gilmore pushing hard to get through. In the second semi final Wraight took on Bailey, with both players being big hitters their striking didn’t disappoint with a number of hits throughout the game with Wraight taking a 31-24 win over Bailey. In the final Wraight was quickest out of the blocks taking a 12-6 lead, then extending this even further to 25-10 on his trademark short marks to the middle of the green. Wraight held off Speed to take a 31-15 win to secure the title and a cheque for £1,200. Speed will no doubt have been cheered up by his cheque for £600, with the losing semi finalists each receiving £250, and the losing quarter finalists taking home £125. At the conclusion of play the presentation was made by event organiser Glynn Hargraves, who thanked the sponsor PokerStars for their continued support, the players for what made for an entertaining evening of bowls, the spectators for turning up to support, all the club members who had helped in any way to prepare for the competition ahead of the day and on the night. Special thanks were also passed to the South Ramsey Ladies who once again catered for the event. 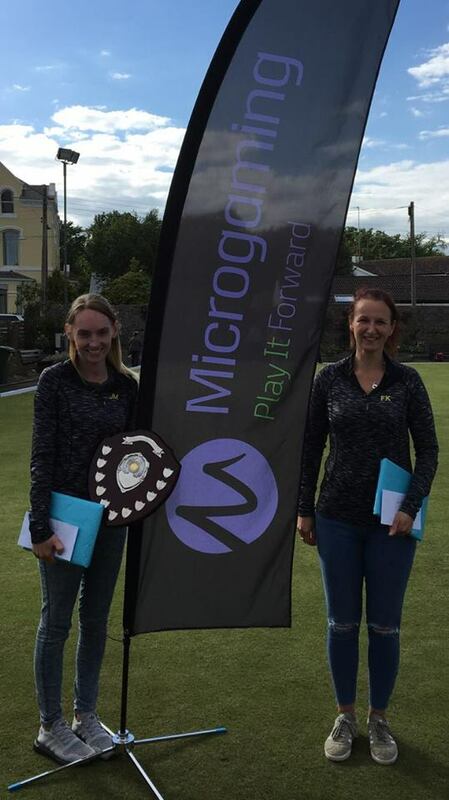 An entry of 19 pairs contested the Ladies Doubles sponsored by Microgaming Software Services on Saturday 16th June at Castletown Bowling Green. The eventual winners were Jenny Moore and Fiona Kennish who beat Philippa Taylor and Joyce Ogden 21-15 in the final. At one stage the final was nip and tuck and at 15-15 Jenny and Fiona scored a maximum 4 followed by a 2 and took the title. Castletown would like to thank the sponsors for their continued support and all the players who entered. The Ladies Night League returned to action following TT fortnight and league leaders Port St Mary extended their winning streak to four matches with a strong away performance against Douglas. South Ramsey keep the pressure on Port St Mary with a strong away performance against Port Erin. Port Erin could only manage two wins with Lynda Cadamy and Leah Vickers winning 21-15 and 21-16 respectively. South Ramsey’s Elaine Moore, Fiona Kennish and Lyn Bolton all won to single figures with the match ending 115-178 (2-7). Purt Le Moirrey welcomed Peel Sunset with the away side taking the spoils 139-153 (3-6). Peel player Mary Moffatt top scored in the match with a fine 21-3 victory whilst home player Linda Dawson won 21-6. Castletown A produced their best result of the season away at Ballaugh. The visitors produced a maximum performance winning 115-189 (0-9) with Marie Ashurst and Heike Perry winning to single figures. Another 100% record went as Gill Dixon lost narrowly to Kim Foy 19-21. In the final match on Friday Castletown B faced Onchan. The match finished with an Onchan victory 148-180 (4-5) however Castletown B are improving each week and it won’t be long until they pick up their first league victory.